A special treat, because we like you so much. We are 54 days away from our biggest AVC ever! As you all know by now, we have FOUR competitions to register for, all of which involve robots, and all of which involve some amount of organized chaos. 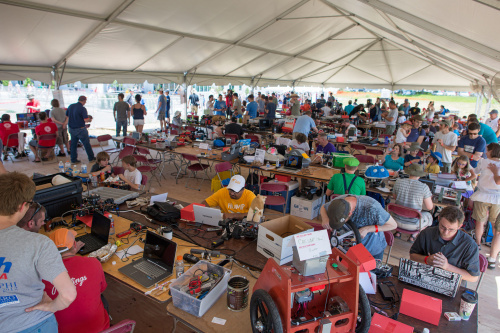 As part of our “pack the pits” effort, we are extending registration for the autonomous competitions until August 15! This should give you plleennnttttyyy of time to say, "Hey, what have I been doing all summer?!?! Wasting time; that's what. I need to register for AVC!" If you’re on the fence about AVC this year, take a look at any of our course preview videos for AVC, PRS, and Combat Bots. And if you have any questions about the competitions, don’t hesitate to send us a note at avc@sparkfun.com. Friday Product Post: Load Up! Hi Kelly! Thanks for asking- I will add that the rules page now, we weren't planning on moving forward with that until closer to the deadline and after registration closed, but feel free to send them to me at avc@sparkfun.com. Does this mean the deadline for demonstrating electronic controlled steering for classic AVC has been pushed back as well? Yes- we will be amending the rules page, the registration page, and sending an email to all currently registered competitors that the first progress verification step (video demonstration of electronic control of steering and throttle) will be due August 25 and the second progress verification step (video demonstration of autonomous 90 degree turn) will be due September 9. AVC Team Registration is open!